Hometown: New Brunswick, New Jersey / Largo, Florida, U.S.
Died: June 1, 2005 in Operation Iraqi Freedom. LARGO, Fla. — The parents of Pfc. 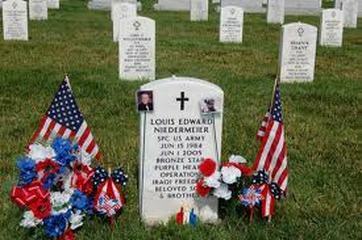 Louis E. Niedermeier want people to remember him as a man who was not afraid to defend his country. The 20-year-old Largo man was killed Wednesday in Ramadi, Iraq, when his unit came under enemy small-arms fire. 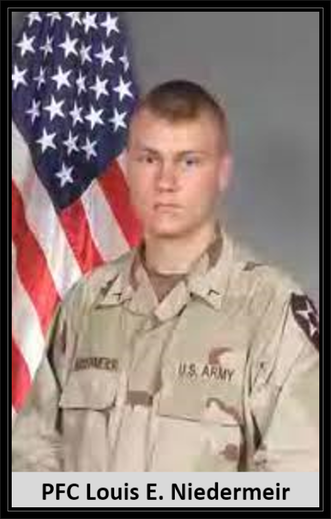 Niedermeier was assigned to the 2nd Battalion, 17th Field Artillery Regiment, 2nd Brigade Combat Team, 2nd Infantry Division based at Fort Carson, Colo.
“I hold my head up really high knowing I raised a boy willing to give his life up for his country,” said his mother, Denise Hoy. Details surrounding his death have not been released, but Ed Niedermeier said his son was shot by a sniper as he stepped from a Humvee. The soldier served as a scout who pointed lasers at targets for other soldiers armed with missiles. “They said he went down fighting,” said Hoy. Niedermeier couldn’t wait to enlist in the Army, but his parents insisted he graduate from Pinellas Park High School in 2003. His unit was sent to South Korea after a stint in Oklahoma and arrived in Iraq a year ago. Niedermeier did not want his family to worry and did not say much about serving in Iraq. But during a visit home in February, he said he saw people dying. Niedermeier told his father he did not want to go back to Iraq, but he knew he had to. Born in New Brunswick, N.J., Niedermeier moved to Florida when he was 5. Both parents came from military families. Niedermeier’s grandmother, Carol Ann Barr said she had a feeling that one of her four grandsons in the military would not be coming home.